If you would like Texas Advertising to market and publish you're directory, please direct all emails to our online submission form located on our Contact Page. When Texas Advertising first took over the official guide of the Texas Association of Campground Owners in 1994, it was merely a pocket-sized pamphlet with 165 park listings and very limited advertising opportunities and travel information. Today, the magazine is 160+ four-color pages, featuring over 400 park listings. Along with an extensive amount of travel information for each region in Texas and a variety of ad placements. Revenue increased more than 20 fold from 1994, in addition to earning numerous industry awards. In 2008, an online version was created to provide consumers with better access to the RV Travel & Camping Guide to Texas. To receive a FREE Texas Saver Card, FREE RV Travel & Camping Guide (featuring 400+ parks in Texas and New Mexico) and TACO E-newsletter, please log on to TexasCampgrounds.com. The 2013 Missouri RV & Camping Guide. A guide for the Missouri Association of RV Parks & Campgrounds. 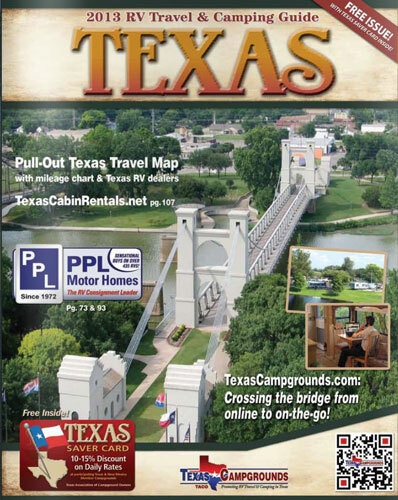 The Missouri Association of RV Park and Campgrounds (MOARC) first approached Texas Advertising to produce and design their annual guide in 2009. MOARC needed a fresh approach to their printed directory, which had been in production for a few years. Texas Advertising was able to market in the Fall of 2009 and the guide became a huge success. The 4" by 9", 32-page, four-color brochure contains more than 70 Missouri park listings and a clear and concise locator map in the center of the publication.